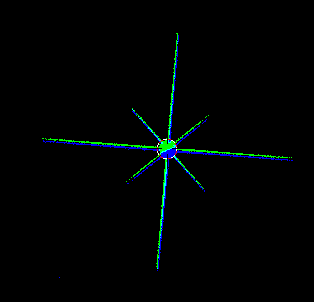 I have a large particle system in which the particles (stars) are colored according to a generated image texture. The image texture was originally 119,617 wide and 1 px high. No matter what I did, the particle colors were sampled 9-13 pixels away from the correct pixel coordinates, and the random nature of the offset made me suspect a numerical error somewhere. I've gone to lengths to verify that 1) the pixel colors are correct for the pixel coordinates, and 2) that the image texture has enough precision to correctly store this information (by saving the image in 32-bit EXR format and loading it to the appropriate Image Texture node). This to say that I trust the image. This places the most likely source of the error somewhere between the Particle Info node, from which I obtain the particle indices, and the Image Texture node, where I assign the particle indices their colors. The original mapping of particle index to pixel coordinate was straightforward. The image texture was a single row of 119,617 pixels, one for each particle, so the normalized x-coordinate (in the 0-1 range expected by the Image Texture node) was simply the particle index divided by the total number of particles (minus 1, because the count starts at 0). I have concerns about dividing over such a large number, and to remove that division as a possible source of error, I've decided to make my image texture 347 pixels wide and 345 pixels high (approximately square). This would reduce any numerical error due to division by ~1e5. The last row of pixels includes some blank pixels, but I don't expect these to give me trouble, since they will correspond to particle indices that don't exist and will simply not be assigned. Roughly: The x-coordinate of the pixel to sample is calculated as the modulo of the particle index and the width of a pixel row (347 pixels). The modulo gives me the remainder of 119,617 / 347, which corresponds to the x-coordinate of the pixel. To normalize that coordinate to the range of 0-1, its value is divided by the width of a row (minus 1 because the count starts at 0). The figure shows the node logic for the pixel row (y-coordinate) calculation (isolated for clarity). The y-coordinate of the pixel to sample is calculated as the difference between the particle index and the modulo calculated above, divided by the width of a pixel row to get the number of the pixel row, divided by the total number of rows (minus 1, because count starts at 0) to normalize between 0 and 1. The figure shows the node logic for the pixel column (x-coordinate) calculation (also isolated for clarity). The figure shows the image texture I used for testing. The different color ranges are there just to give me a sense of which pixel in the image texture a chosen particle landed on (that particle being #32263, the Hipparcos catalog number for the star Sirius A). 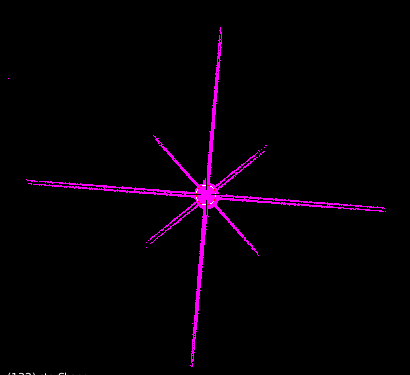 The magenta pixel between the yellow and blue pixels is the correct color for that star (row 92, column 339 of the image texture). Below is the disappointing result. Sirius shows up yellow. 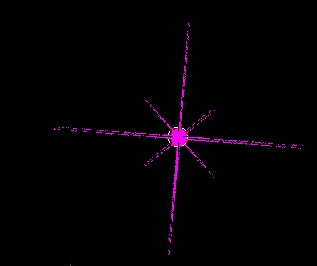 I spent an inordinate amount of time (on the order of days) just adding and subtracting from the calculated pixel coordinates, trying to get the magenta color. Shifting the pixel row up by 1/344 turns Sirius A blue. Shifting the pixel row down by the same amount turns it red. Sadly, doing this to the pixel column seems to have no effect. 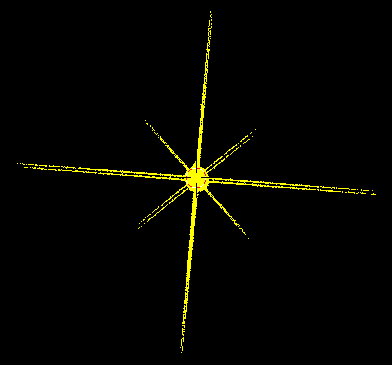 When the image texture was a single horizontal row, I was consistently off (for this particular star) by -13 pixels. EDIT: Manually entering pixel coordinates in a Combine XYZ node and feeding them to the Image Texture node gives me the correct color (which, of course, being just a single number with no reference to particle index, is applied equally to every particle). The fractions in the Combine node are 339/346 for x, 92/344 for y, and 0.5 for z. ...Yet, calculating those exact same numbers from the particle indices gives an error. I've been grappling with this issue for a week and can't see what could be wrong. Could it be that the Index output of the Particle Info node is off somehow? EDIT: I've verified that the mapping from particle index to pixel coordinates is correct. I did this by replacing the Particle Info node with a Value input node and setting the value to 32,263 (the particle I've been using for testing). This gives me the correct color. Adding an offset to the mapped pixel coordinates changes the color as expected, and going outside of the width and height of the image texture makes the particle go black (because no color). However, adding back the Particle Info node (and making no other changes) brings back the incorrect color mapping. This means that the issue is in the index output of this node. I can think of two possible issues: the node itself outputs the wrong particle index (although I consider this sort of bug unlikely); or the particle index does not correspond to the vertex index, which is what I've been using for testing. EDIT: Having run more experiments, it is now clear that the issue is not a numerical error but a mismatch between the indices of the particles and those of the vertices from which they were generated. In my testing, I have been going on the assumption that each particle would be placed at the coordinates of the vertex of the same index. I saw no reason why this shouldn't be. I didn't use any randomness in my model, and there were no child particles. So it seemed that vertex 32263, for example, would spawn the particle of index 32263. But this is not so. The indices weren't off by much: only -13 places for particle 32263 (out of 119617 total). But they were off, so no matter what I did to the image texture or to the calculations used to map particle indices to image texture pixels, the colors were never correct. Browse other questions tagged python cycles texturing particles image or ask your own question. Size limit of generated texture images? Set emission strength with alpha port of image texture node? Correspondence between particle indices and vertex indices? 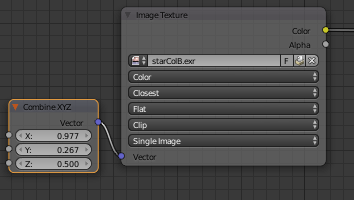 Move particles to specific vertex positions?